Ever wanted to start up your own car detailing business in Cairns, Townsville or Gold Coast? If you like working with cars and desire the freedom to work your own hours that suit your lifestyle, then this car detailing and cleaning business for sale opportunity could be perfect business for you! With the growing demand for auto detailing and cleaning, a professional auto car detailing and cleaning business should provide a thorough and right way of cleaning all carpet and upholstery. Though we have already lots of mobile car detailing businesses but many of them simply clean the vehicle's exterior, wheels, door trims, windows, and dashboard. However, customers also want to get rid of the amount of soiling in seats and carpet in their cars. To address such demand, Duplex Cleaning Machines have developed and is now offering this car detailing and cleaning business for sale opportunity. Duplex have the range of dry steam vacuum cleaning equipment that are ideal for thorough cleaning and sanitizing automobile carpets and upholstery. Why use Duplex dry steam vacuum cleaning equipment? Duplex dry steam vacuum cleaning equipment supply low water usage products that are ideal for starting up your own car detailing business without all the expensive overheads. These ranges of dry steam cleaning equipment are also great for removing stubborn grease, oils, road grime and brake dust from the exterior of the car. 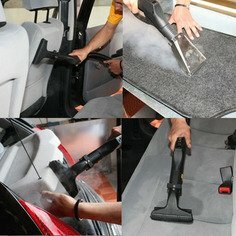 Furthermore, the car interior detailing equipment of Duplex features a host of technologies that makes any mobile auto detailing task more effective and efficient. Plus all Duplex steamers acquire 94% dry steam vapour technology which, allows carpets to dry faster than water extraction mobile car detailing machines. It will completely dry carpets and upholstery in as little as 30 minutes compared with up to 24 hours of water extraction methods. This method what makes your auto detailing and cleaning business one step ahead to others because fast drying times are essential for auto car detailing business as customers often need cars immediately. No fees or contracts that lock you in. You could choose from the Basic Package, Pro Package to Expert Package and we will provide you with the cleaning equipment you require to start up a successful car detailing and cleaning business.